The Image Carousel is a core component that is in several features in our system. In this article we’ll go over how to use it, and how it can help enhance your user’s experience within the app. What are some use cases of Image Carousel? You can use the Image Carousel to display images for the service times of your church, or your current ministries that you’re showcasing at the time. For your Real Estate app you can use the Image Carousel to display different listings, and you can use it to send people to a website link with more information for each listing. If you’re building an app for a local sports tournament, you can use the Image Carousel to showcase the sponsors for that event. This is a great opportunity to sell ad space in your app. What are the Image Carousel’s primary functions and what are the steps to accomplish them? As we mentioned in the introduction to this article, the Image Carousel can be found in a number of the features in our system. Let’s go over the primary functions of the Image Carousel and how to set it up. First, we’ll go over how to add an image to the Image Carousel. Once you’re at the feature that you want to add an image to, click on the “Add Image” button. This will bring up the Media Library. Now that the Media Library has been opened, you can select one or multiple images to add to the Image Carousel. To do this, simply click on the image, or images and select “Insert Image(s)”. 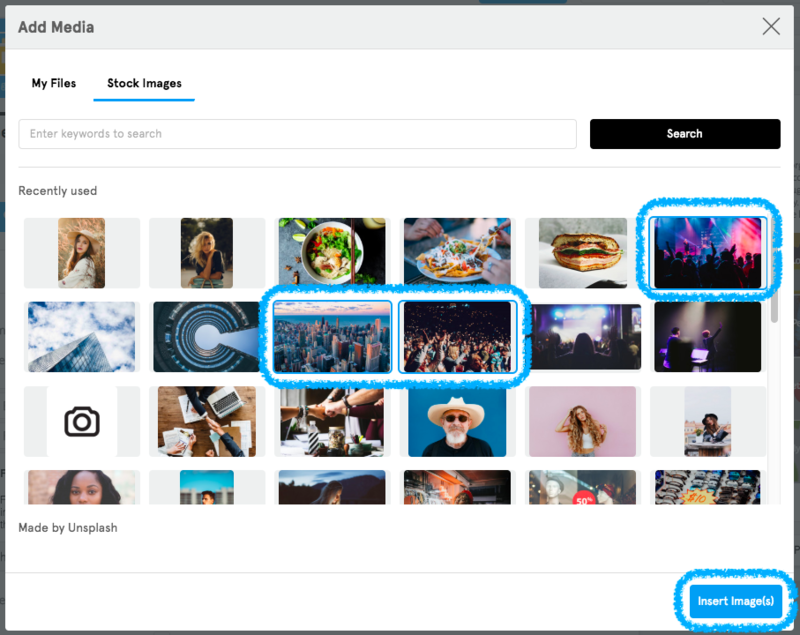 If you don’t see the images that you want to add to the Image Carousel, you can upload them to the Media Library here. If you would like to learn more about the Media Library, you can do so here. Congratulations! You’ve added an image or images to the Image Carousel! There’s no limit to the amount of images that you can add to the Image Carousel, but if you add a lot of images it may affect the performance of your app. Now let’s go over the other function that allows you to add actions to the images that you’ve uploaded with the Action Builder. Action Items are a great way to add functionality to your app. 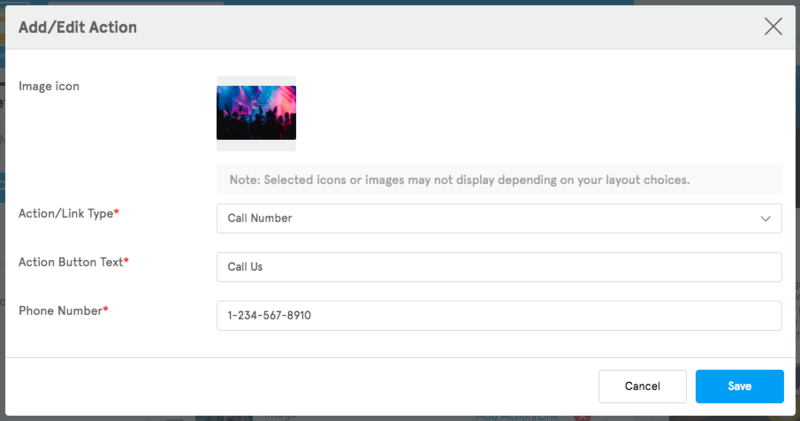 With the Action Builder you have the ability to attach various actions such as linking to app content, calling a phone number, sending an email, sending a text message, opening a map, and more. Here we’ll briefly go over how to use the Action Builder. If you would like to learn more about the Action Builder, you can do so here. 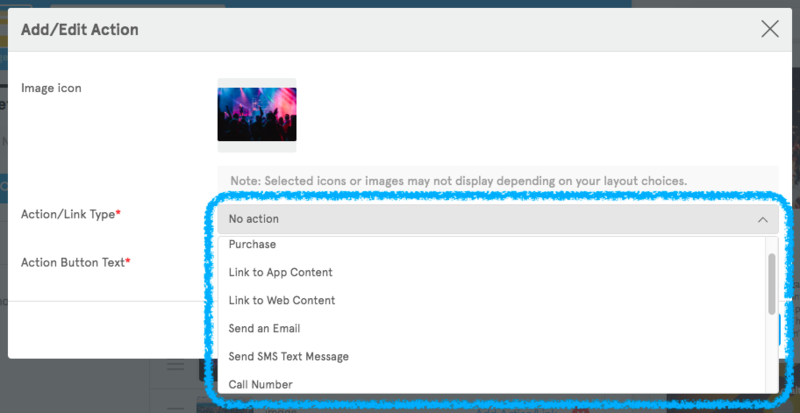 Once you’re ready to add an action to an image, click on the “Add Action/Link” button next to the image. This will bring up the Action Builder. Once you have the Action Builder open, you can now select the type of action that you want to assign to that image. There’s many options to choose from, so we recommend that you select the one that works best for what you’re looking to do with that image. 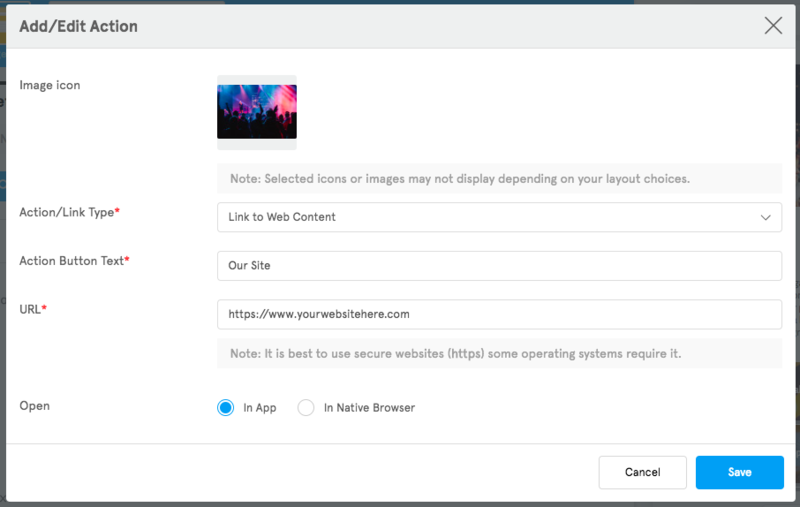 Once you’ve selected the action that you want to assign to that image, you’ll be prompted to fill out any additional information required for that action to work. Different actions need different types of information. Congratulations! You’ve now added an action to that image! Now whenever users tap on that image the action that you set up will happen! The Image Carousel can be a very versatile tool! If you start to think about all the things you can use an image for, the possibilities are near limitless. Some people use the Image Carousel to display upcoming events or speakers for a conference, some use it to display enticing shots of their restaurant’s location and food. With the Action Builder, you can add a wide number of actions to the Image Carousel making it far more than just a gallery of images. We encourage you to take the time to go through the different actions available in the Action Builder so that you can come up with unique ways of using the Image Carousel with Action Items! Are you building an app for an event and you want to make a little bit of extra money with your app? With the Image Carousel you can sell ad-space for sponsors of the event. This lets people know who helped fund that event, and allows you to put a little extra money in your pocket..